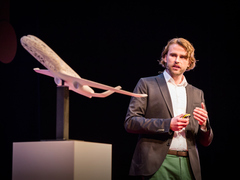 Bastian Schaefer: A 3D-printed jumbo jet? Bastian Schaefer of Airbus has a far bigger use in mind. In today’s talk, he shares a vision for the sustainable future of aviation: a jumbo jet that’s light, cheap and spacious, with an exterior that mimics the structure of bone. He imagines the jet as a “living, breathing organism,” complete with its own consciousness. And he imagines the jet printed from the ground up. Why use 3D printing technology to create the plane of the future? Bastian explains that unlike traditional machining — which removes material from a larger piece of material — 3D printing is an additive process, layering material on top of material. Thus, there is little to no waste. 1. Rocket parts. NASA is working on the largest rocket ever constructed that is projected to take humans to Mars by 2030. Bypassing traditional processes for building rocket parts, which require welding of seams, creating a single seamless 3D printed piece means less chance for leakage. It also cuts down the cost of manufacturing by almost half. Recently, NASA tested 3D-printed rocket engine injectors in hot-fire tests, exposing them to extreme temperatures and pressures. They passed with flying colors. 2. Guns. Marc Goodman, in his 2012 TED Talk, pondered the effect that new technologies like 3D printing would have on crime. He proposed a scary scenario: cheap guns and bullets that can be printed in one’s own home. A year later, Defense Distributed founder Cody Wilson created and shot the first 3D printed handgun in May 2013. And up until a few months ago, blueprints were available to the public on his website. 3. Meat and leather. The US startup Modern Meadow is working on creating meat and leather products — without killing animals. Founder Andras Forgacs, who spoke on the TED Global 2013 stage, asked, “Animal products are just collections of tissues. So what if instead of starting with animals, we started with cells?” Using a stem-cell sample taken from a biopsy, the cell is cultured until it’s multiplied. Then this bioink that contains hundreds of live cells is printed, and the cells form living tissue. Forgacs is starting with leather, then moving on to meat. 4. Virtually any food. Can the technology of 3D printing be harnessed to tackle world hunger? Anjan Contractor, a mechanical engineer at Systems and Materials Research Corporation, is working on a prototype for a “universal food synthesizer.” It sounds like a crazy science fiction story: a 3D printer in each household with the ability to print healthy meals from powders, with a shelf life of at least 15 years. But it’s becoming a probable reality. 5. A house. Designer Alastair Parvain explores the idea of regular people being able to print and construct their own homes. In his TED Talk, he talks about WikiHouse, an open-source construction kit that’s a library of 3D models and cutting files that will allow anyone using a CNC machine and plywood, to “print” out the parts for their own house. Meanwhile in Amsterdam, construction of a 6-meter tall printer called the KamerMaker (Dutch for room-maker) has already begun for printing components of a house. 6. Liquid metal parts. At North Carolina State University, researchers developed a metal alloy that remains at a liquid state at room temperature. They then used a syringe to arrange the droplets into a vertical chain-like structure. The next step, now, is to create a 3D printer for the purpose of printing this liquid metal. If the technology is harnessed, it would allow for the creation of bendy electronics, and revolutionize the electronics manufacturing process. 7. Bionic ear and jaw bone. Right now, the potential for 3D printing in the medical sphere is incredible. Last year, an 83-year-old Belgian woman received the first 3D printed jaw bone, a transplant that was tailored specifically for her facial structure. A bionic ear was printed from a concoction of calf cells and hydrogel and antennae made from nanoparticles. The first version allowed hearing at a superhuman range, powerful enough to pick up radio waves. 8. High fashion. Designers are already experimenting with 3D-printed materials in creative and innovative ways. The cheaper cost of manufacturing would certainly have an impact on the current system of mass production. Silk is already being experimented with. MIT researchers have used 6,500 silkworms to 3D-print this ethereal silk dome-shaped pavilion covering. 9. A Moon base. Architecture firm Foster + Partners have paired with The European Space Agency to investigate the possibility of a 3D printed moon habitat. The material used in the printing process would be moon dust and soil that would be layered to form a building block, not unlike concrete. This method would save us from the challenge of transporting raw building materials. Reblogged this on SHADES AVENUE / Avenue des Ombres. This is why you need to be very careful what products you purchase and use on yourself and family! My products are much, much safer than commercially made products!! I’m fascinated by 3D printers, this is a really timely article.